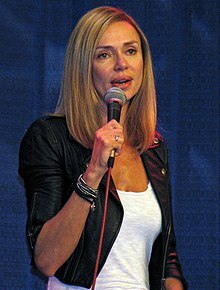 ونسا آنجل (اینگیلیسجه: Vanessa Angel) بریتانیالی مانکن و اوْیونچو ۱۰ نوْوامبر ۱۹۶۶ ‏ میلادی تاریخینده لندن شهرینده دۆنیایا گؤز آچیب. 1990 King of New York 'British Female' bodyguard of Frank White. 1988 Equalizer, TheThe Equalizer Christine Hayes "Video Games"
1991 Baywatch Megan "The One That Got Away", "The Trophy: Parts 1 & 2"
1992 On the Air Chorus Girl "The Lester Guy Show"
1992 Raven Flight Attendant "The Unseen Enemy"
1993 Melrose Place Karen "Carpe Diem", "State of Need"
1993 Murder, She Wrote Kathryn Scofield "The Phantom Killer"
1994 Time Trax Jane Hawkins "The Gravity of It All"
1997 Veronica's Closet Suzanne "Veronica's Best Buddy", "Veronica's a Doll"
2000 Stargate SG-1 Anise / Freya "Upgrades", "Crossroads", "Divide and Conquer"
2003 Division, TheThe Division Mary Turner "Body Double"
2005 Entourage Vanessa Angel "I Love You Too"
2009 Saving Grace Pauline Hoover "The Heart of a Cop"
2012 Californication Alison "The Way of the Fist"
اینگیلیسجه ویکی‌پدیاسی‌نین ایشلدنلری طرفیندن یارانمیش«Vanessa Angel»، مقاله‌سیندن گؤتورولوبدور. ( ۲۱ دسامبر ۲۰۱۷ تاریخینده یوْخلانیلیبدیر). قارداش پروژه‌لرده ونسا آنجل گؤره داها آرتیق بیلگی‌لر تاپابیلرسینیز.